The SR 520 Bridge Replacement and HOV Program is reconstructing SR 520 in phases, primarily working from east to west. The next phase of corridor improvements will be in the Montlake area. We expect Montlake Project construction to start in spring 2019 and ramp up as the year progresses. You can learn more about later phases of SR 520 construction in Seattle on our Rest of the West webpage. We designed our Construction Corner webpages to make it easier for the public to learn about any SR 520 construction that’s underway or scheduled in the weeks ahead, whether it involves highway closures, detours, nighttime work, or other community effects. The Construction Corner also describes our responsibilities and protocols for limiting the community effects of our construction. Wondering if SR 520 is going to be closed for construction next weekend? Or how long a detour on your local street will last? Check our SR 520 Construction Map to learn more about SR 520 construction activities that are underway or coming soon. 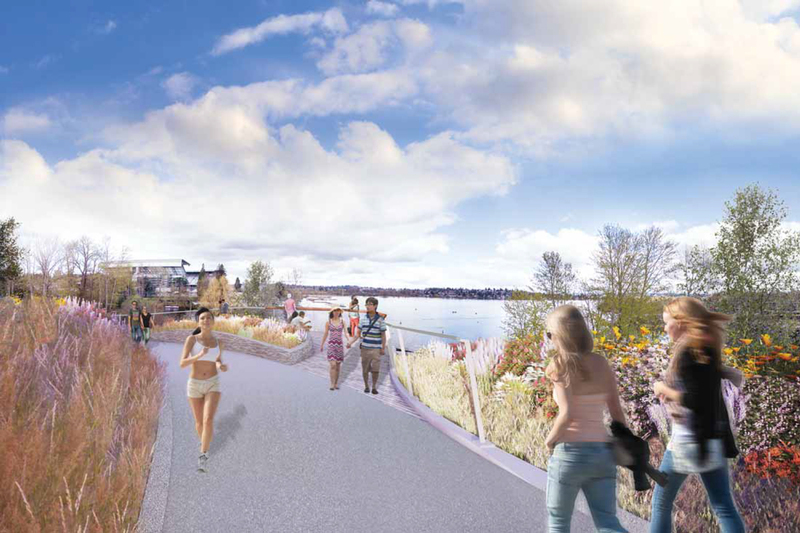 When: Montlake Project construction expected to begin in spring 2019; 4- to 5-year duration. NOTE: Specific construction means and methods to be determined by contractor at a future date. 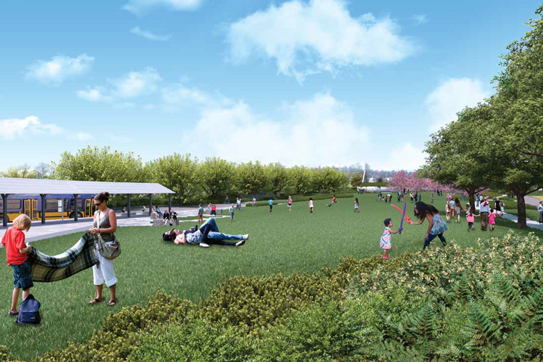 What: A 30-foot- wide, landscaped crossing over I-5 for pedestrians and bike riders. When: Project construction estimated to begin in 2023; 6-year duration. Where: SR 520/I-5 crossing along Roanoke Street. Examples of what to expect: Some nighttime work, construction traffic, periodic temporary lane closures on I-5. What: Landscaped lid over SR 520 in Roanoke area, with community open space. When: Portage Bay Bridge and Roanoke lid construction estimated to begin in 2023; 6-year duration. Where: Between Delmar Drive E and 10th Avenue E.
Examples of what to expect: Periodic highway or lane closures; detours (vehicles, pedestrians, bicycles); noise; construction traffic; some nighttime work. What: A new, reversible transit/HOV ramp between SR 520 and the I-5 express lanes; a modified, reversible ramp between the I-5 express lanes and Mercer Street; restriped I-5 express lanes to retain the existing four general-purpose lanes while adding a transit/HOV lane. 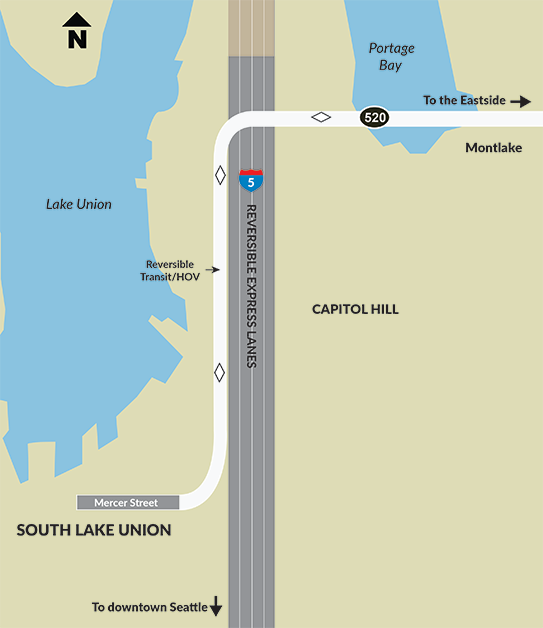 When: Project construction expected to begin in 2020; connection expected to open to transit as early as 2023, and open to carpools upon completion of a new Portage Bay Bridge and Roanoke lid. Where: Between SR 520 / I-5 interchange and I-5 / Mercer Street interchange, along I-5 express lanes. Examples of what to expect: Periodic highway closures; detours; noise; construction traffic; some nighttime work. What: New, seismically improved Portage Bay Bridge, built as two side-by-side structures, with bicycle and pedestrian path on the south side of the bridge; transit/HOV lanes in both directions. When: Portage Bay and Roanoke lid construction estimated to begin in 2023; 6-year duration. Where: Between Boyer Avenue E and Montlake Boulevard E, over Portage Bay. Examples of what to expect: Demolition of existing Portage Bay Bridge, periodic highway closures, construction traffic, pile driving, noise, vibration, some nighttime work. 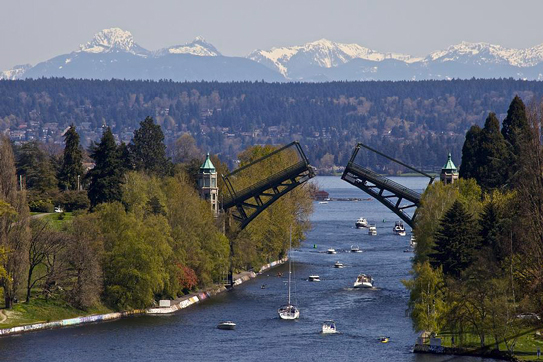 What: A second drawbridge over the Montlake Cut. WSDOT is working with the city of Seattle and community stakeholders to refine the new bridge’s design. When: WSDOT is working with the city of Seattle and community stakeholders to determine project timing. Where: Across the Montlake Cut, to the east of the existing Montlake Bridge. Examples of what to expect: Periodic closures of local streets, detours, construction traffic, some nighttime work.